Clay Cure Happy Mud Soaking Clay is the fun way to enjoy a mud bath. Soothing ionic energy and beneficial minerals combine to make a mud bath suitable for all ages. Clay has long been used as a health treatment in Spas around the world. A clay bath is a gentle and pleasant way to detox as it absorbs toxins rather than forcing them out like a sauna. Clay is activated by contact with water; an ionic exchange takes place that draws impurities and toxins out of the skin. 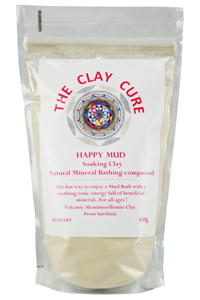 Bathing in Happy Mud Soaking Clay will leave you feeling relaxed, clear headed and deeply refreshed. Your skin will be soft and rejuvenated thanks to the deep cleansing action of the clay. How does Happy Mud Soaking Clay work? Clay particles carry negative electrons whilst toxins carry positive electrons. Toxins are attracted and 'pulled' inside the clay molecule. 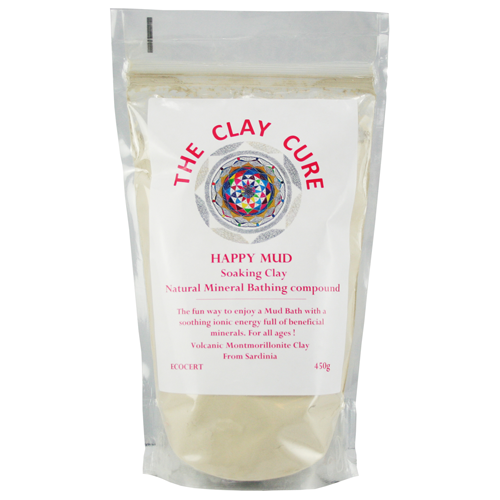 Use ½ to 1 cup of Happy Mud in one bath filled with warm water. Soak your body in clay water for a minimum of 20 minutes. Shower the residue of clay from your skin. It is important to drink plenty of water to re hydrate the body. Happy Mud; volcanic (beige) montmorillonite clay from sardinia.